A subtropical wetland in Florida, USA, with an endangered American Crocodile. A wetland is a transitional environment between permanently aquatic and terrestrial environments that shares characteristics of both environments and where water, which covers the soil or is near the surface for substantial parts of the year, is the key factor in determining the nature of the ecosystem and soil. Although wetlands have aspects similar to both wet and and dry environments, they cannot be classified unambiguously as either aquatic or terrestrial (Barbier et al. 1997). Wetland do not have to be wet all the time, but generally are at least periodically covered by or saturated with water. Among types of wetlands are swamps, marshes, and bogs (defined below). They are found on every continent except Antarctica and from the tundra to the tropics (EPA 2006a). The great variety of wetland types and the difficulty in defining their boundaries makes establishment of a precise definition difficult and controversial (Barbier et al. 1997). As Barbier et al. (1997) note: "How often and for how long does land have to be flooded before it is considered a wetland? The problems are compounded by the fact that many wetlands evolve over time, starting as open water, but infilling with sediment and vegetation eventually to become dry land." Nonetheless, the importance of establishing a working definition has led various intergovenmental and governmental bodies and academicians to establish definitions. Some of these are reproduced in the definitions of wetlands below. Wetlands provide innumerable economic, ecological, cultural, recreational, and aesthetic values. The rich biodiversity of wetlands has led to their being described as "biological supermarkets" and "nurseries of life"; their chemical and hydrological functions have led to their characterization as "the kidneys of the landscape" (Barbier et al. 1997; Mitsch and Gosselink 1993). They offer goods such as fish, timber, and peat; supply water; provide flood control; are important for groundwater recharge and discharge, water purification, and nutrient retention; are habitat to a great amount of flora and fauna; and add to the human wonder of nature. Despite these many values, the historical view of wetlands was that they were "wastelands." Such a perspective found value in draining, diking, and otherwise modifying them in order that the lands serve intensive agricultural, residential, or industrial uses. Some wetlands were lost via mining, waste disposal, pollution, or redirecting the water for more valued purposes. It is estimated that 50 percent of the world's original wetlands have been lost, and 54 percent (87 million hectares) of original wetlands in the United States (Barbier et al. 1997). France, Germany, Italy, and Spain have reported losses from 57-66 percent in the twentieth century (Barbier et al. 1997). Article 2.1 of this Convention further notes that areas designated wetlands "may incorporate riparian and coastal zones adjacent to the wetlands, and islands or bodies of marine water deeper than six metres at low tide lying within the wetlands." "those areas that are inundated or saturated by surface or ground water at a frequency and duration sufficient to support, and that under normal conditions do support, a prevalence of vegetation typically adapted for life in saturated soil conditions . "Wetlands are lands transitional between terrestrial and aquatic systems where the water table is usually at or near the surface or the land is covered by shallow water. For purposes of this classification wetlands must have one or more of the following three attributes: (1) at least periodically, the land supports predominantly hydrophytes; (2) the substrate is predominantly undrained hydric soil; and (3) the substrate is nonsoil and is saturated with water or covered by shallow water at some time during the growing season of the year." Mitsch and Gosselink (1986) recognize wetland as an environment "at the interface between truly terrestrial ecosystems and aquatic systems making them inherently different from each other yet highly dependent on both." The two basic types of wetlands are coastal wetlands, found along the ocean, and inland wetlands. Wetlands are found under a wide range of hydrological conditions, but at least some of the time water saturates the soil. The result is a hydric soil, one characterized by an absence of free oxygen some or all of the time, and therefore called a "reducing environment." Plants (called hydrophytes or just wetland plants) specifically adapted to the reducing conditions presented by such soils can survive in wetlands, whereas species intolerant of the absence of soil oxygen (called "upland" plants) cannot survive. Adaptations to low soil oxygen characterize many wetland species. Intertidal wetlands are found in coastal areas where air temperature, wave action, salinity levels, and sediment movements are moderated by the locational features of the estuarine environment and ecosystem. Wetlands are a vital part of the ecosystem that provide clean drinking water for millions. There are many types of vegetation in wetlands. 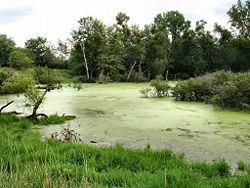 Marshes are dominated by soft-stemmed vegetation, while swamps in the United States are dominated by woody plants (EPA 2004). White cedar, tamarack, and white pine are examples of trees found in swamps in the United States. Fens, freshwater peat-forming wetlands, are covered mostly by grasses, sedges, reeds, and wildflowers, while bogs, characterized by spongy peat deposits, have evergreen trees and shrubs and a floor covered by sphagnum moss (EPA 2004). Peatland can be dominated by red maple, silver maple, and elm trees. Some types of trees in peatland can exhibit lower trunks and roots that have adapted to the wet surroundings by forming buttresses. These are strange raised roots that resemble knees. Below the canopy, there are often limited amounts of shrubs such as speckled alder, winterberry, and sweet gale. Plants such as cattails, bulrushes, sedges, arrowhead, water lilies, blue flag, and floaters like common duckweed may be found in various wetlands. Pondweed is also another type of plant that grows in wetlands, but it is not easily seen. A bog or muskeg is acidic peat land (peat bog). It is a freshwater wetland, often formed in old glacial lakes and characterized by spongy peat deposits (EPA 2004). A moor was originally the same as a bog but has come to be associated with this soil type on hill-tops. A fen is a freshwater, peat-forming wetland with chemically basic (which roughly means alkaline) ground water. This means that it contains a moderate or high proportion of hydroxyl ions (pH value greater than 7). A carr is a fen that has developed to the point where it supports trees. It is a European term, mainly applied in the north of the United Kingdom. A fresh-water marsh's main feature is its openness, with only low-growing or "emergent" plants. It may feature grasses, rushes, reeds, typhas, sedges, and other herbaceous plants (possibly with low-growing woody plants) in a context of shallow water. It is an open form of fen. A coastal salt marsh may be associated with estuaries and along waterways between coastal barrier islands and the inner coast. The plants may extend from reed in mildly brackish water to salicornia on otherwise bare marine mud. It may be converted to human use as pasture (salting) or for salt production (saltern). A swamp is wetland with more open water surface and deeper water than a marsh. In North America, it is used for wetlands dominated by trees and woody bushes rather than grasses and low herbs, but this distinction does not necessarily apply in other areas, for instance in Africa where swamps may be dominated by papyrus. A dambo is a shallow, grass-covered depression of the central and southern African plateau that is waterlogged in the rainy season, and usually forms the headwaters of a stream or river. It is marshy at the edges and at the headwater, but maybe swampy in the center and downstream. A mangrove swamp or mangal is a salt or brackish water environment dominated by the mangrove species of tree, such as Sonneratia. A paperbark wetland is a fresh or brackish water environment dominated by the Melaleuca tree. A bayou or slough are southern United States terms for a creek among swamp. In an Indian mangrove swamp, it would be called a creek. A constructed wetland is artificially contrived wetland, intended to absorb flash floods, clean sewage, enhance wildlife or for some other human reason. A pocosin is a bog-like wetland dominated by fire-adapted shrubs and trees, found mainly in the southeastern United States on the Atlantic Coastal Plain. Time lapsed animation of basin from 1956 to 1993. In the United States, the four general categories of wetlands, according to the Environmental Protection Agency, are marshes, swamps, bogs, and fens. The U.S. Fish and Wildlife Service's National Wetlands Inventory (NWI) produces and provides information on the characteristics, extent, and status of U.S. wetlands and deepwater habitats and other wildlife habitats. The NWI also produces periodic reports on the status and trends of wetlands in the conterminous U.S. The NWI website includes a Wetlands Mapper in which users can view, download, or print maps of digital wetlands information. The Pantanal is an example of a wetland system that involves a variety of wetland types. An immense alluvial plain, the Pantanal is considered by many to be the world’s largest, freshwater, wetland system. It is situated along the northernmost part of the Paraguay River and its tributaries and becomes extensively flooded during the rainy season. It extends through millions of hectares of central-western Brazil, eastern Bolivia, and northeastern Paraguay in central South America. Estimates of its size range from 140,000 square kilometers (54,000 square miles) to 210,000 square kilometers (81,000 square miles), making it larger than many countries. Within the Pantanal are diverse types of riverine, lacustrine, and palustrine wetlands, as well as large rivers, lakes, and other standing water and terrestrial ecosystems. Riverine refers to river-related environments, and lacustrine to lake-related environments, while palustrine include inland wetlands that lack flowing water, such as inland marshes, swamps, bogs, and fens. Wetlands are among the world's most productive environments and provide innumerable economic, ecological, cultural, recreational and aesthetic values. We can look at such values in terms of wetland components, functions, and attributes (Barbier et al. 1997). Components. The components of wetland systems include such economically beneficial goods as fish, timber, peat, and wildlife. Wetlands likewise provide water supply for domestic, agricultural, and industrial uses, and the structure of wetlands may allow for economical water transport. Some wetland systems offer enriched agricultural land as a result of improving the soil fertility through periodic inundation of flood waters. Fish and wildlife provide opportunities for leisure fishing activities and tourism. Barbier et al. (1997) report that two-thirds of the fish we eat depend upon wetlands at some stage of their life cycle. In Vietnam and Thailand, the Melaleuca wetland forests provide many diverse products, including medicine (Barbier et al. 1997). Functions. Wetlands also fulfill important functions, such as flood control, groundwater recharge and discharge, water purification through retention of sediments and pollutants, storm protection, water table maintenance, and stabilization of climate. Nutrient retention occurs when nutrients such as nitrogen and phosphorus accumulate in the sub-soil or vegetation and allow eventual circulation back into the atmosphere. Wetland may serve as sediment settling ponds. By absorbing the force of strong winds and tides, wetlands protect terrestrial areas adjoining them from storms, floods, and tidal damage. Wetlands remove nutrients from surface and ground water by filtering and by converting nutrients to unavailable forms. Denitrification is arguably the most important of these reactions because humans have increased nitrate worldwide by applying fertilizers. Increased nitrate availability can cause eutrophication, but denitrification converts biologically available nitrogen back into nitrogen gas, which is biologically unavailable except to nitrogen fixing bacteria. Denitrification circulates the nitrogen back into the atmosphere. Denitrification can be detected in many soils, but denitrification is fastest in wetlands soils (Ullah and Faulkner 2006). Attributes. 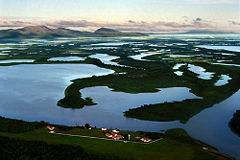 An attribute of wetlands is biodiversity. Being transitional between aquatic and terrestrial environments, and involving complex interactions among such components as water, soils, topography and biotic communities, wetlands help to preserve biodiversity. This provides not only for a more stable system, but tourism and aesthetic appreciation also are often tied to biodiversity. Many wetlands also provide habitats for resident and migratory fish and wildlife. There also are cultural aspects. For example, the Marsh Arabs of southern Iraq have lived in harmony with the marshes at the confluence of the Tigris and Euphrates rivers and they have a spiritual connection that goes beyond the direct use of the wetland products (Barbier et al. 1997). Likewise, the Fens of East Anglia and Somerset levels in the United Kingdom are important for cultural heritage (Barbier et al. 1997). The Pantanal of South America provides an example of the above. As a wetland system of exceptional size, the Pantanal embodies many of the aforementioned values in a big way. It has one of the most impressive freshwater fisheries on the earth, serving an exceptional biogenetic reservoir. The Pantanal supports a large number of species and also an abundantly high concentration of animals, perhaps the highest in the New World and comparable to the densest animal populations in Africa (Andrade et al. 1985; Pádua 1991). The Pantanal not only provides an extensive water supply and transport system for its inhabitants, but it serves to remove sediments and pollutants, thus improving the water quality for millions of people downstream. The reduced water velocity in the Pantanal, and its storage of water, create excellent circumstances for mineral uptake by plants, microbial processing, and the settlement of sediments and chemicals such as heavy metals, which are sorbed to sediments (Gottgens 1998). Flood control is another major value of the Pantanal. The Pantanal has a regulatory effect on the Rio Paraguay, extensively reducing and delaying the height of the flood peak and thus reducing the flood risk downstream. Because of the Pantanal, the flood peak of the Paraguay is as much as two to three months later than the Paraná into which it empties, avoiding the cumulative impact of these two flood peaks combining downstream. Small wetland in Marshall County, Indiana. Intertidal wetlands provide an excellent example of invasion, modification, and succession. The invasion and succession process is establishment of seagrasses. These help stabilize sediment and increase sediment capture rates. The trapped sediment gradually develops into mud flats. Mud flat organisms become established encouraging other life forms changing the organic composition of the soils. The mangroves establish themselves in the shallower water upslope from the mudflats. Mangroves further stabilize sediment and over time increase the soil level. This results in less tidal movement and the development of salt marshes. The salty nature of the soil means it can only be tolerated by special types of grasses (e.g. saltbush, rush, and sedge). There is also changing species diversity in each succession. In the salt marshes, there is greater species diversity, nutrient recycling, and niche specialization making it one of the most productive ecosystems on Earth. In intertidal wetlands, the majority of natural stress comes from salinity and tidal movements. The intertidal wetlands must be able to survive extreme conditions of mainly salt water at high tide, fresh water at low tide, and times of flood and brackish water at other times. The saline water is a very difficult condition for plants to survive in. The gray mangrove accomplishes this by excluding salt in the root system, salt glands in the leaf, and waxy leaves to minimize water loss. However, it is vulnerable to changes in salinity levels. Changes to tidal movements through increased run-off or altered drainage can cause the roots of mangroves to be inundated for longer than normal periods affecting their pneumatophones. It can also be pushed past its threshold level if water quality is changed. Thus, even healthy ecosystems are vulnerable to change. Some species such as oysters and mollusks have been used as indicator species, with any decline in their numbers indicating the ecosystem is under stress. A change in nutrient levels may also affect primary productivity and thus bring about change. A temperate wetland in Britain, with shallow open water and reedbeds. Historically, humans have made large-scale and small-scale efforts to drain wetlands for development or flood them for use as recreational lakes. Wetlands are often filled in to be used by humans for everything from agriculture to parking lots, in part because the economic value of wetlands has only been recognized recently. For example, the shrimp and fish that breed in salt water marshes are generally harvested in deeper water. As a result, 50 percent of the world's original wetlands are believed to have been lost. Barbier et al. (1997) report that in Portugal 70 percent of the Western Algarve has been converted for agricultural and industrial development and that in the Philippines, 67 percent of the country's mangrove resources were lost between 1920 and 1980. they likewise report a loss of 67 percent of the wetlands in France between 1900 and 1993, 66 percent of the wetlands in Italy between 1938 and 1984, and 60 percent in Spain between 1948 and 1990. They report 54 percent of the United States's original wetlands have been lost, while the Environmental Protection Agency (2004) notes that the United States loses an additional 60,000 acres of wetlands every year, and this is a leading cause of species extinction. Humans can maximize the area of healthy, functioning intertidal wetlands by minimizing their impacts and by developing management strategies that protect, and where possible rehabilitate those ecosystems at risk. Since the 1970s, more focus has been put on preserving wetlands for their natural function—sometimes also at great expense. One example is the project by the U.S. Army Corps of Engineers to control flooding and enhance development by taming the Everglades, a project that has now been reversed to restore much of the wetlands as a natural habitat and method of flood control. Fifty years after ditching and diking the Everglades and affecting the flood-and-drought cycle, over 50 percent of the "River of Glass" has been lost, largely due to conversion to intensive residential and agricultural purposes, and the number of one-legged wading birds plunged by up to 95 percent or more (Swarts 2000). The estimated price tag to restore this is in the many billions of dollars. Exclusion—Those responsible for the management of wetland areas often facilitate public access to a small, designated area while restricting access to other areas. Provision of defined boardwalks and walkways is a management strategy used to restrict access to vulnerable areas, as is the issuing of permits whilst visiting. Education—In the past, wetlands were regarded as wastelands. Education campaigns have helped to change public perceptions and foster public support for the wetlands. Due to their location in the catchment area, education programs need to teach about total catchment management programs. Educational programs include guided tours for the general public, school visits, media liaison, and information centers. Andrade, C. D., A. Magnanini, L. C. Marigo, A. de Oliveira Gomes, and P. H. Britto. 1985. Pantanal. Rio de Janeiro: Assessoria de Comunicação e Marketing. Cowardin, L. M., V. Carter, F. C. Golet, and E. T. LaRoe. 1979. Service wetlands definition. U.S. Fish and Wildlife Service. Retrieved July 24, 2007. Environmental Protection Agency (EPA). 2006a. What are wetlands?. U.S. Environmental Protection Agency. Retrieved July 24, 2007. Environmental Protection Agency (EPA). 2006b. Wetlands definitions. U.S. Environmental Protection Agency. Retrieved May 3, 2008. Environmental Protection Agency (EPA). 2004. Wetlands overview. U.S. Environmental Protection Agency EPA 843-F-04-011a (December 2004). Retrieved July 24, 2007. Gottgens, J. F., et al. 1998. The case of the Paraguay-Paraná waterway ("Hidrovia") and its impact on the Pantanal of Brazil: A summary report to the Society of Wetland Scientists. Wetlands Bulletin 12-18. Mitsch, W. J., and J. G. Gosselink. 1993. Wetlands, 2nd edition. New York: Van Nostrand Reinhold. ISBN 0442008058. Pádua, M. T. 1991. Quoted in Vic Banks, The Pantanal: Brazil's Forgotten Wilderness. San Francisco: Sierra Club Books. ISBN 0871567911. Swarts, F. A. 2000. The Pantanal is the 21st Century: For the planet's largest wetland, an uncertain future. In F. A. Swarts (ed.) The Pantanal. St. Paul, M.N. : Paragon House. ISBN 1557787913. Ullah, S., and S. P. Faulkner. 2006. Denitrification potential of different land-use types in an agricultural watershed, lower Mississippi valley. Ecological Engineering 28(2): 131-140. This page was last modified on 7 August 2013, at 17:31.